Greetings everyone. 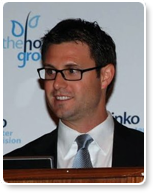 My name is Brendan McGinnis and I head up The Horinko Group’s Water Division. I’d like to welcome you to our Second Annual Water Summit entitled, Sustaining Our Nation’s Water Resources – Answering the Call for Stewardship. First and foremost, a special thank you to this year’s Gold and Silver Summit sponsors. If not for the generosity of these organizations, today’s event would not be possible. Thank you to our Summit Partners and presenters. We want to express our gratitude for your continued efforts. Many colleagues from these organizations are participating in today’s program. I encourage you to seek them out during the luncheon and reception, say hello, each of these folks is working hard to make a difference and it’s an honor having them with us today. This year’s Summit has been recognized as a featured program of UN Month, in recognition of the formation of the United Nations on October 24, 1945. The United Nations Association of the National Capital Area has reached out to number of local organizations to help celebrate this commemorative occasion. We are honored that today’s program is part of the month’s water-related festivities. I also want to offer a special thank you to our gracious host, the University of Maryland. We are pleased to have a number of faculty and students that will be joining us throughout today’s discussion. And last, but certainly not least, thank you to each and every individual that chose to participate in today’s dialogue. We commend your interest in these critical water matters that affect us all. Looking ahead to today’s program, I’d like to take a step back and quickly reflect on why we are emphasizing stewardship. We believe a focus on stewardship will foster a shift toward a system context for management and governance, providing the rationale to move us from the current compliance culture where we find ourselves in. A sustainable water future for us all rests on an informed and engaged water resources community. Everyone in this room has a shared responsibility to move our society from being simple water users to becoming conscientious and well-informed water stewards. When appropriately informed, we are confident our communities will be repositioned to make a greater contribution driven by a greater sense of informed concern for actionable problem solving. So, how de we effectively reach the public? We provide them with the tools they need to understand the complexity of natural systems, and then listen to their input. Effective public involvement means effective listening. The process of briefing the solution and then taking comments has to give way to an ongoing water conversation. Diverse approaches need to be available to meet the needs and aspirations of diverse audiences in different regions, sometimes facing unique constraints. Broader representation within affected communities must be a part of this process. We must all become more effective communicators and find the common sense in all of this. Be honest, frank and open. People care more about trust, credibility, competence, fairness, and empathy than about statistics, charts, and graphs. In looking at the structure and flow of today’s program, we broke out three topical areas of focus – governance, advocacy, and the business of water, which shaped our three panels. Panel one, to begin shortly, is going to focus on governance and how the federal family and their state counterparts can best match authorities to current water challenges. Panel two will examine the role advocacy must play in producing an informed and interested citizenry around water. The final panel will center on the business of water, providing a closer look at private-public partnerships, a new paradigm for compliance, making the case for water re-use, and a great deal more. For those of you attending today’s luncheon, you will enjoy hearing from our keynote, Steve Hoffmann. If you have not yet read his book, Planet Water: Investing in the World’s Most Valuable Resource, I highly recommend it. It is a terrific read. Finally, I hope each of you find today’s program fresh and informative. As this concludes the formal portion of our program, I hope this dialogue will help to advance our joint efforts by shedding additional light on the critical areas – governance, advocacy, and the business of water. I believe it’s no secret to any of us that gross deficits and ever-shrinking budgets are contributing to a growing urgency for sensible, cost-effective solutions to address our most pressing water and energy challenges. Better leveraging of resources and broader engagement can be realized through more effective collaboration and creating an inclusive platform to educate and engage all stakeholders. Collaboration and interdependence have become crucial. And, at the heart of it all, each of us must take an active role in securing our common water future. It’s in our hands. Let’s all become more informed and hand’s on. Before I conclude, I want to offer a very sincere thank you to our partners, panelists, moderators, and luncheon speaker. Your efforts and commitment are testament that perhaps we are arriving at a tipping point where some collective resolve for innovation can drive real traction. Perhaps these complex water problems are not beyond our collective reach to address.